The Association Kolla-Breizh which was created in October 1996 in Rennes (France) aims at having poeple from Bretagne discover Bolivia through its cultural and musical traditions. The main activity of Kolla-Breizh is based on animating a musical working group among which poeple can initiate themselves to the practise of the Siku (an andean panpipes called « Zampona » in spanish) an emblematic instrument from the Indian Bolivia. Thanks to this musical working group Kolla-Breizh is led to perform our region, sharing thus an easy, lively and friendly music. 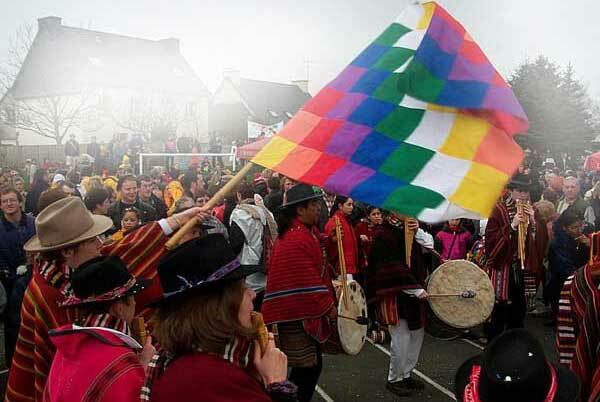 Kolla-Breizh organizes some « peña » nights (cabaret nights) as well , where music and tradition from both Bolivia and Bretagne can meet. At least Kolla-Breizh takes part in the conferences' organization at the coming of representative poeple of some popular organization from Bolivia and from some other American countries. Kolla-Breizh's plans for the coming months are still about the cultural aspect of Bolivia: Painting exhibitions by bolivian artists who live in France, Traditional music concert and string instruments concert , studies of musical pieces which are for a great part bolivians , within the musical working group.